After two decades as an antique dealer, I have experienced and observed quite a bit — including the incessant need by some to try to define the latest “trends” in antique collecting. The mere questioning of which antiques will be most popular this season or what innovative ways they will be arranged or photographed in a current home magazine is contrary to the antique’s intrinsic value to society. Antiques are not anonymous entities but speak for people and their times, reflecting mankind’s triumphs and mistakes… successes and follies — all while providing collectors with an opportunity to examine themselves through what they choose to own. At my shop, the finest antique furnishings await your discovery — and in this process I hope they help you to discover a new part of yourself. 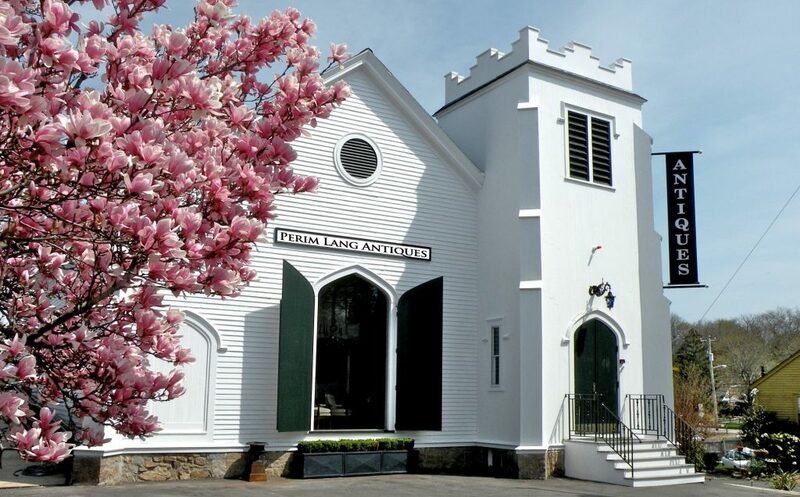 In 2008 Perim Lang Antiques moved its extensive inventory into a 4500 square foot Essex, MA landmark formerly known as the Methodist Episcopal Church. As part of the move, the building was restored to its circa 1911 appearance, including a modest bell tower reputed to have been constructed from salvage of ships from nearby Story’s Boat Yard.